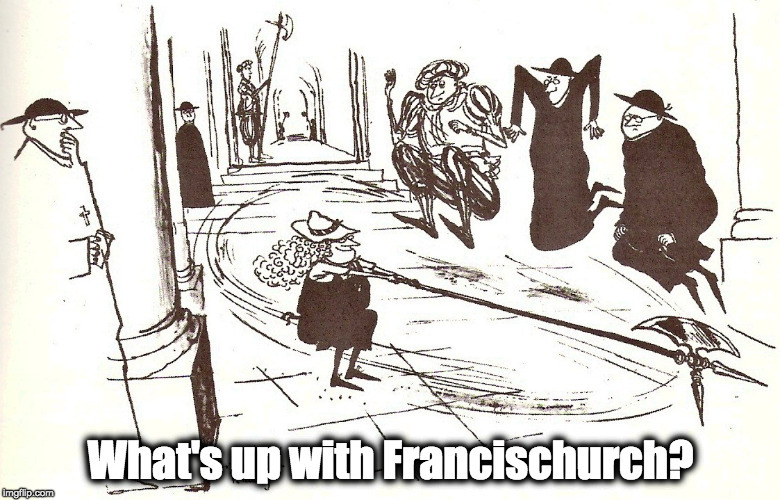 No room for moderation: “The Francis machine isn’t going to stop until everyone is either with them or out.” – What's Up With Francis-Church? It was the conflict, the contradiction, that the FFIs tried to avoid, but that was finally forced on them: a choice between the New Catholic Paradigm so energetically promoted by Pope Francis and co., or the Faith of our fathers, and all its goals. In the 70s this incompatibility was perhaps not so clear. But it’s pretty clear now. I’m just revisiting briefly the terrible, awful but extremely informative tale of the Franciscan Friars of the Immaculate. Not many have talked much about the money angle of course, with the ideological aspect of it being the main point of interest for believers. And its perfectly clear that the FFIs were attacked for their refusal to go along with the Novusordoist New Paradigm. But the money is pretty significant too, not least because the final tally amounts to nearly 30 million Euros. It’s worth looking into. But getting back to the Hilary Thesis: that this pontificate is intended by God to “sift” and “winnow” the faithful, to force people finally to choose a side and get off the “conservative” fence, to stop trying to appear “moderate”. The word “moderate” is popular in our times. Newspaper reporters have only two political categories to talk about parties in Europe; you are either “centre” or “extreme,” with it being very obvious that these are substitutes for “good” and “evil”. Of course one never hears any reference to the “extreme left”. No, that epithet is only ever attached to the “right”. It’s barely OK (that is, they won’t call the cops) to be “centre-right”. Naturally these terms are applied more or less arbitrarily, because, as we have learned, whether you are “centre” or “extreme” – as with being “conservative” or “liberal” – depends entirely upon who is standing next to you. We’ve been trained to unconsciously assume that “centrist” in politics and “moderate” in religion is the human ideal. That “moderate” = good. But the whole thing is smoke. In our degenerate times, however, Catholics have failed to recognise this smoke and have unconsciously adopted these criteria, internalising them and applying them according to a completely made-up set of standards to everything they see. Thus, the Franciscan Friars Immaculate could be “extreme” or “rad-trad,” or “conservative” or “centre” or “moderate” all depending on which publication you are writing for. Hot, not cold, and decidedly immoderate. I know thy works, that thou art neither cold nor hot: I would thou wert cold or hot. So then because thou art lukewarm, and neither cold nor hot, I will spew thee out of my mouth. Now it seems like a funny thing to be accusing the FFIs of being on the fence. They certainly have a great reputation for an evangelical Catholic orthodoxy, and for asceticism and fidelity to their charism. But look more closely. It was on the most important question of our times that they refused – programmatically refused – to decide. The same question that we are all now being forced to decide on. All sources say that it was fear of being labeled “traditionalist” in the theological sense – as opposed to merely having an aesthetic preference for the smells and bells – that Fr. Manelli most feared. They say that he was “at pains” to always be seen to celebrate both the old and the new rites, and that it was forbidden in the institute to say negative things about Vatican II. And I think, reading the Traccia, that Fr. Manelli’s discomfort with the New Paradigm of Vatican II, if it exists at all, must have been a later development. The Traccia is full of positive references to Pope Paul VI, not something one would be likely to find in a “crypto-lefebvrian” document. It is possible, I suppose, that their protestations of “acceptance” of the Council were genuine. Indeed, it is hard to imagine such a man dissimulating for political reasons. It is well known, however, that in Italian ecclesial politics, merely being accused of any sympathy for or likeness to Archbishop Marcel Lefebvre is the equivalent of an accusation of communism by the HUAC committee. But the documentation shows that the FFIs were extremely careful never to criticise the Ordinary Form or any of the outcomes of Vatican II, had introduced the Old Rite incrementally and had never issued a blanket order for it in every house. But stop a moment; what are you really doing when you’re hotly denying being a Traditionalist? 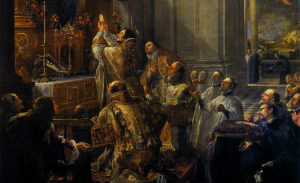 What is the one thing that separates the Traditionalist Catholics from the merely conservative novusordoist Catholics? It’s not the Mass. It’s not a matter of preference for Latin, incense or any other external thing. 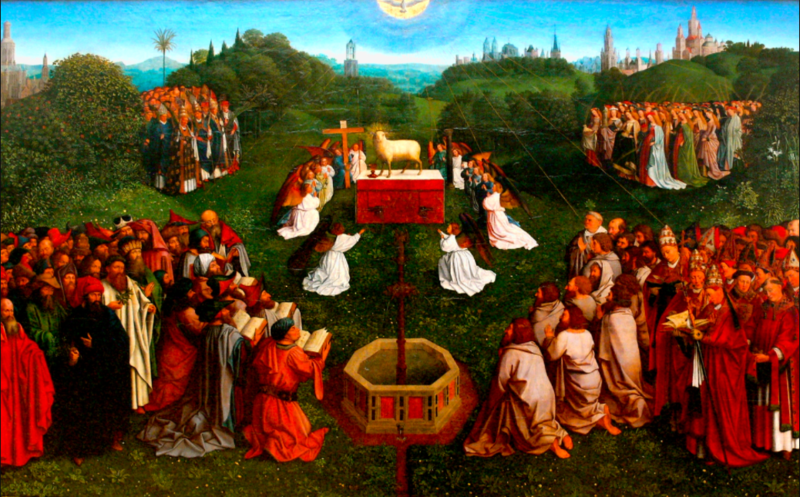 It’s the Social Reign of Christ the King; the “conquest of all souls for God,” as Fr. Manelli’s Traccia put it. Traditionalist Catholics believe that it is the purpose of the Church, founded and mandated by Christ, to convert every single human being on earth to the Faith, and to have Catholic principles guiding every nation. Now, what is the one thing that the Francis Vatican is most energetically doing lately? You will see immediately the problem. It was the conflict, the contradiction, that the FFIs tried to avoid, but that was finally forced on them: a choice between the New Catholic Paradigm so energetically promoted by Pope Francis and co., or the Faith of our fathers, and all its goals. In the 70s this incompatibility was perhaps not so clear. But it’s pretty clear now. It is, in fact, the choice that everyone is going to have to make at some point, because it seems clear that the Francis machine isn’t going to stop until everyone is either with them or out. And the fact that the FFIs were chosen, alone among all the communities of religious, to be made an example of, says a lot both about them and about all the other “conservative” communities that weren’t attacked. It also indicates that the bold approach is not only more honest, but more effective. All the tiptoeing around on VaticanTwoist eggshells, the self-censoring, accommodating and attempts to walk that friendly, we’re-harmless, “conservative” middle way between the contemporary Church’s two competing proposals didn’t avail them much. So, lesson learned, hey? Be a traditionalist and don’t apologise. They’re going to hate you anyway, so you might as well go all in. Spring the trap before it gets you. In short, it is the very act of sitting on the fence that raised them up to the level where they could be more easily targeted. They tried to hide in “moderation,” thinking it the same thing as prudence. But who are the “moderate” saints? Do we point to Thomas More, the calm and rational gentleman? Beheaded of his own free will. Do we like St. Francis de Sales, the saint of gentleness? Spent his life refuting heretics. There is nothing of moderation in our religion. Prudence, yes. But it is sometimes prudent to be martyred, which anyone would regard as extreme. No incident of the Francidian pontificate more aptly proves my thesis than what happened to them, and what they did – or failed to do – to bring catastrophe upon themselves. What is the lesson of the FFIs? Decide freely now, one side or the other, because you will have the choice forced on you eventually. The day is coming. And this is the reason I am grateful to God for this monstrous pontificate; it is providing every Catholic with the opportunity to choose for Christ now, before that terrible moment when we will know it is too late. Our Most Gracious Majesty has, in His infinite mercy and patience, allowed us to choose between life and death, between, as He put it above, being “hot or cold”. But I would strongly suggest choosing the former. The immediate pains may be great, but the long term rewards are more glorious than any of us is capable of imagining. There is no where else for this to go. Of course this is being discussed among the “choir” so it’s not news, but in case there are some in the “trying to get up to speed” phase (where we’ve all been) — this is seriously the time for penance. Especially now with Francis granting permission for sacrilegous communion in an Apostolic Letter. Kyrie Eleison. Prayer alone is not enough. All of us have to look hard at ourselves and what we need to do to put God and Penance at the center of our lives. May God forgive me my penitental failings and give us all strength. This is going to a very bad place. For anyone looking for a place to start, The Little Way and The Militia of the Immaculata provide good starting points for the laity. I’m so happy to have found whatisupwiththesynod with this first article because FINALLY, I have found someone who clearly sees and EXPLAINS what I have known for some time but have not been able to put into words. An excellent article – and I will be checking this site every day from now on. May God bless you and your work. Thomas More surely. Do you remember the late +Mario Palmaro? Heroic man who stood toe to toe with Francis. Remember him in your prayers please. Given that Pope Francis is an instrument of the devil and Vatican II is his war strategy, why wouldn’t occur to the FFI guys and any other Catholic order to simply bail out and either join up with SSPX or Bishop Sanborn of Holy Trinity Seminary? I don’t believe lying down for Pope Francis to be trampled on is a smart thing. Anyway, if it were me I would be long gone under the circumstances. If Pope Francis thought religious orders would bolt if he pushed too hard, he would back off. If it were me I would not put up with his nonsense. Excommunication by Pope Francis would be a mark of honor. Let us all resist as best we can!! St. Francis himself refused to hear anything negative vs. the reigning pope or even priests. It is a fidelity to the office they hold and being the anointed of Christ. It is not about fence sitting but the effort to remain with ‘Peter’ which is difficult these day because the present man in the office does not seem to want to remain with ‘Peter’. The FFI were the darlings of St. John Paul II and Pope Benedict and that is also a mark against them in this pontificate that seeks to wipe out the good of the previous pontificates. Also, when the present pontiff was an cardinal he was known to be anti-traditional. He knew the FFI who were just beyond his reach and he does not forget as we have seen. One of the first things he did was to let the Institute know that he had not forgotten and with the help of a few disgruntled friars who wanted a different direction, he took his shot. Many holy ones have managed to escape the friars and sisters since the ax over the Order is to eviscerate the charism but many faithful ones are left and they continue to perform their daily duties. They do not take vacations and are true to their charism which has yet to be gutted even though the threat is there. Yes, I agree that under better circumstances, this Order will bloom and grow as never before. God and Our Lady will reward their faithfulness. And, yes, I agree that Fr. Manelli is a very faithful man and saintly too. Coming soon… a shut-down of the Priestly Fraternity of St. Peter and the Institute of Christ the King, along with rescinding of Summorum Pontificum. No, Sam. Jose Carballo was one of Francers’ first appointments, yanked out of the Friars Minor moments before the cops swooped in. I strongly believe that Father Manelli FFI is a saintly man, and that he has been deceived by the Ratzingerian hermeneutics out of innocent mistake, and not out of malice. The severe trials that he and his order have been going through were both for their greater perfection in holiness and a divine visitation to reveal to them that the mentioned hermeneutics are in reality a compromise of the Apostolic Faith with the revolutionary modernity. I cannot help but be strongly inclined to believe that God has yet great plans with the Order of the FFI; such severe trials as they have endured are usually a preparation and prelude to exalted spiritual conquests. Regarding the introduction of political terminologies into ecclesiastical life; it is a lamentable profanation of the correct understanding of what the Church is. 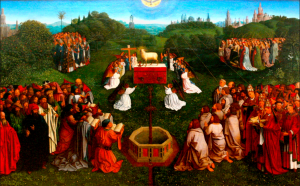 The terms “Right” and “Left” (as employed today) have no significance even within civil politics; much less is it a good idea to apply them to ecclesiastical matters. The only time when these terms had a significant meaning in civil politics was at the time when they were coined, which was in revolutionary France when the Catholic monarchists were designated as the Right because they stood at the right side of the King during the Assemblée of cursed memory, whereas the anti-christian and anti-monarchist revolutionaries were called the Left, since they stood at the left side. If we, Catholics, want to employ these terms in our days, then let us use them in their original sense. In that original sense of the terms, Stalin, Hitler, Obama, Clinton, Trump, Marine Le Pen etc. must all be called Leftists. 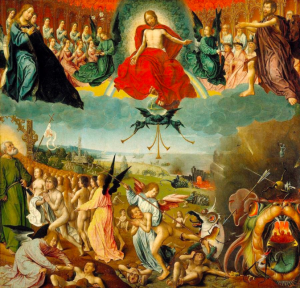 You are on the Right in that sense when you are Catholic, against “popular sovereignty”, against the revolutionary, anti-divine “Rights of Man”, and a proponent for the Social Reign of His Divine Majesty, Our Lord Jesus Christ, through the Sorrowful and Immaculate Heart of Mary. Yes, there is a natural and a supernatural element to the FFI story. But please remember, the broke “Just call me Pepe” Carballo got the ball rolling during Pope Benedict XVI’s reign.